Found these cute Earth Day cupcakes on bystephanielynn.com. Aren't they great? And super easy! We added a sparkly cloud of cream cheese icing on top. Hope the kids at the boys' school like them! These are the photos my MIL took at her luncheon. Does she set an amazing table or what?!? 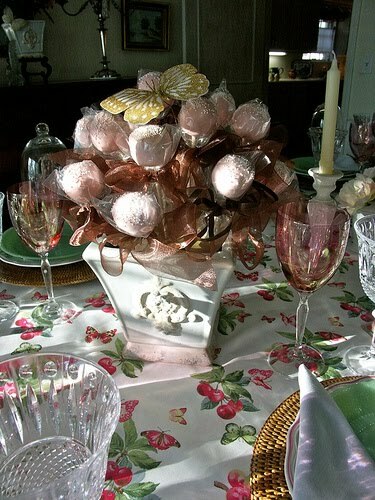 She used the cake ball pops as part of the centerpiece taking it over the top with glittered butterflies that matched her table cloth. 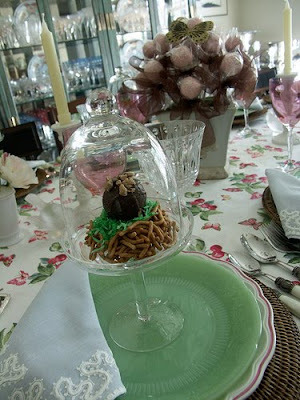 Another friend of hers made the adorable birds' nests. Waiting for each friend under the glass dome is an Almond Amaretto Cake Ball. Modified the classic chocolate chip cookie dough recipe to exclude eggs. Then I added some cream cheese frosting. These are dipped in dark chocolate.